This larger version of our CoffeeCakes.com blueberry coffee cake is burstin' full of bouncing blueberries! This blueberry coffee cake is a brunch and breakfast favorite. CoffeeCakes.com Blueberry Coffee Cake has fresh blueberries and maple syrup to a traditional sour cream coffeecake batter. 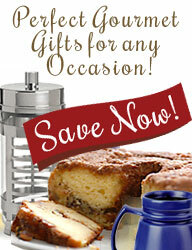 We're delighted to offer CoffeeCakes.com Blueberry Coffee Cake in both regular-size and large-size cakes!